Hello there again! How is everyone??? I hope you are enjoying your day and having fun skipping around to each of the Curiosity Crew's blogs to check out the new challenge! This week's challenge is to use the Embossing Defuser on page 61 of Compendium of Curiosities Vol. III....which you can still get from Tim and Mario! To be completely honest I had bought these when they first came out and they had never been out of their package. I think we all do that, wink. Have to have it...and it goes in a pile or a drawer and it's forgotten. That is one of the reasons I LOVE doing these challenges. It makes us use those stashed items, or things we might not ordinarily try. So today I am sharing a tag that I will use as a tag on a package or actually frame and give as a gift. They blend into this beautiful warm color. LOVE those colors together. I stamped Tim's wood grain stamp on another tag with Gathered Twigs and then blended the same over the stamped image. The sentiment is stamped on a piece of Coordinations and then the "technique" from CC3. That is one of the reason's I love this quote! Of course, I love to get that number "THREE" in there! Three tags adhered together, three butterflies and the three clip. Here is a little closeup so you can see the technique up close and personal, wink. So make sure and read the rules listed here and join us! We love to see your art!!! You guys have been so inspiring and it is so fun to hop around and see what y'all do too! Inspiration Emporium who donated a generous gift certificate...and of course Tim and Mario who donated so many goodies for the participants!!! Okay...of to see what the rest of the Curiosity Crew did! Have a great weekend...hugs till next time! Thanks so much Anne! I know...when I first blended those colors together, I did a very giddy happy dance...coudn't contain myself...the color is just scrumptious! hehehe. Can't wait to see what you do, wink. Big hugs. Yvonne...your tag is so pretty! Your butterflies are always an inspiration on your work. Your use of the oval diffused embosser to make your sentiment the focal point of your tag is wonderful. Love the sentiment and your blog post! There's the Yvonne Blair signature pink and butterflies. I LOVE this tag! Such a great message too. Your creations are always so feminine and beautiful. There you go again, Yvonne, creating another lovely butterfly card! Do did such a wonderful job with the diffuser! Awesome! Brilliantly beautiful! 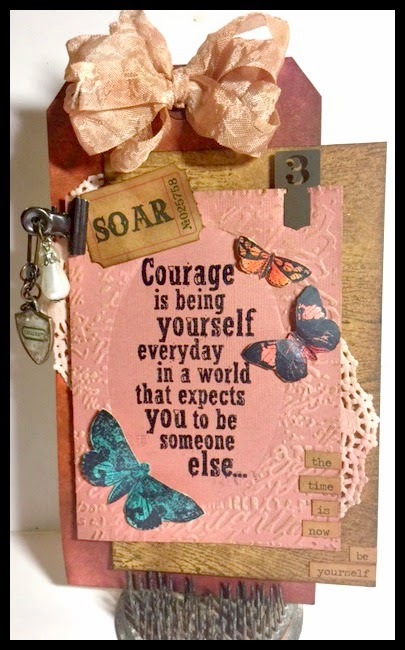 I LOVE that your Quirky Girl stamps fits perfectly in that diffused oval! All of your layering and coloring is fabulous, as usual and your repeated "threes" are perfect. That woodgrain stamp is one of my all time favorites. Nicely done, darlin'! It's sooo awesome that you had the courage to be yourself and admit that you had something in your stash you hadn't used - ehhehehehe!! So fun Yvonne. Your project turned out unique and lovely. Thanks bunches for sharing. j.
I had to have mine when it first came out too. I did take them out of the package and played around with them but hadn't created anything yet. I guess now is the time. Love your blue butterfly and the way you've hung embellishments from the clip. Someone is going to love getting this tag. So inspiring. Thanks! Um, yeah...I just now got mine out, too! LOL But it's been wonderful seeing all the inspiration from the AWESOME Curiosity Crew; you guys always rock it! 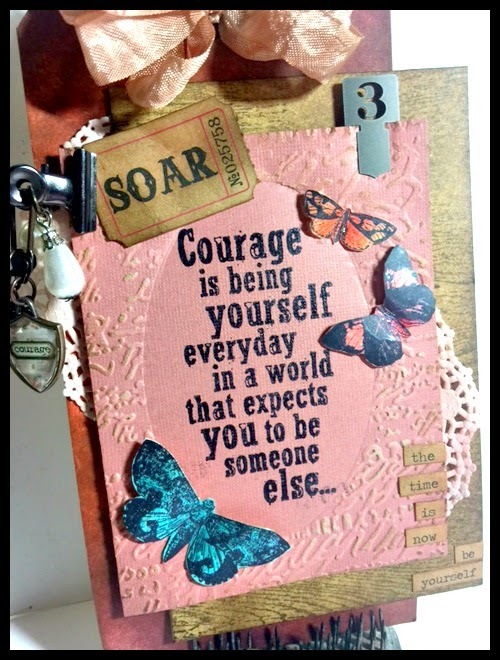 I love the colors you blended on that tag; I will have to try that combo! You are just to dang sweet!!! Thanks so much for you sweet comments! It's fun to pull out those hidden away stashes isn't it? Have fun and happy creating...can't wait to see what you make!!! Hugs. Thank you Shari....I so understand that busy life thing...most days I need them to be twice as long! hehehe. Have fun with those diffusers! I'm glad you have been inspired. Can't WAIT to see what you do!!! big hugs! We have missed you too! Love,the layering and the color blend!! I'm guilty also. I've had a couple for awhile and they never left the packaging. I even watched a You tube video to use it correctly. Beautiful Tag! I love this tag and I love the sentiment that you used, I must have it! That's one of my fave sentiment stamps and I love the butterflies. I'm fond of all the "3's" on this fab project Yvonne! All good things come in "threes", or so I like to think! And this is certainly a good thing! love this color combo. Your card is simply fabulous. Wow..those colors do blend well..never would have thunk! Your tag came out great! Love those butterflies! Yvonne, this is such an inspiring tag! I love the quote you used and how you have composed this entire piece! Great colors, too! Thank you for sharing your wonderful creativity with us! 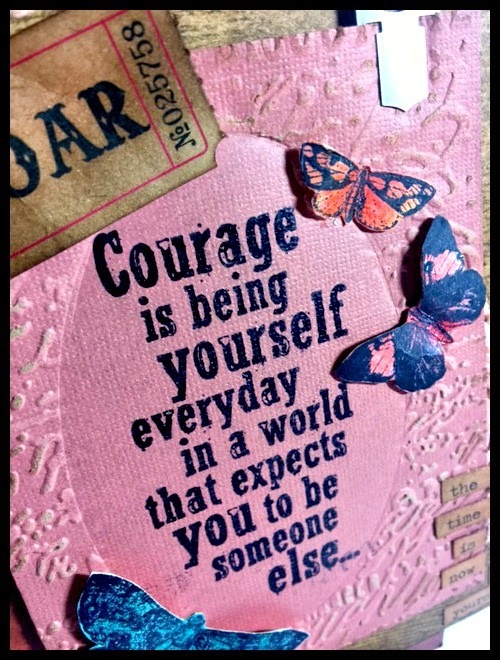 What a fabulous card and a fabulous sentiment. I think we should all be different and give up all trying to look the same - vive la difference! Such a charming tag. :) I love the butterflies! This is really neat! My faves are the items you chose to add as hanging, and the saying itself: how true!!!! Inspiration at its very best! !